How do scientists use acoustics to locate Pollock (and serendipitously other ocean creatures)? Scientists aboard the NOAA Research Vessel Oscar Dyson use acoustic, specifically hydroacoustic data, to locate schools of fish before trawling. 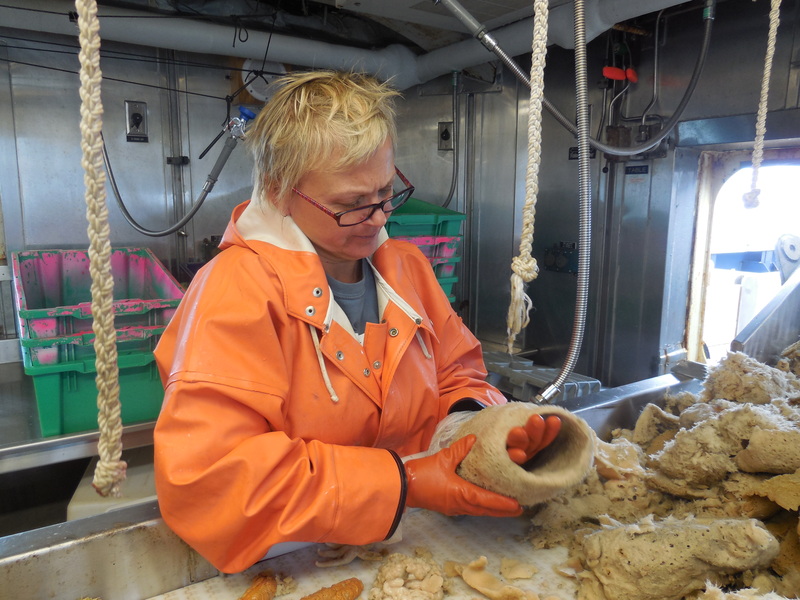 The trawl data provide a sample from each school and allow the NOAA scientists to take a closer look by age, gender and species distribution. 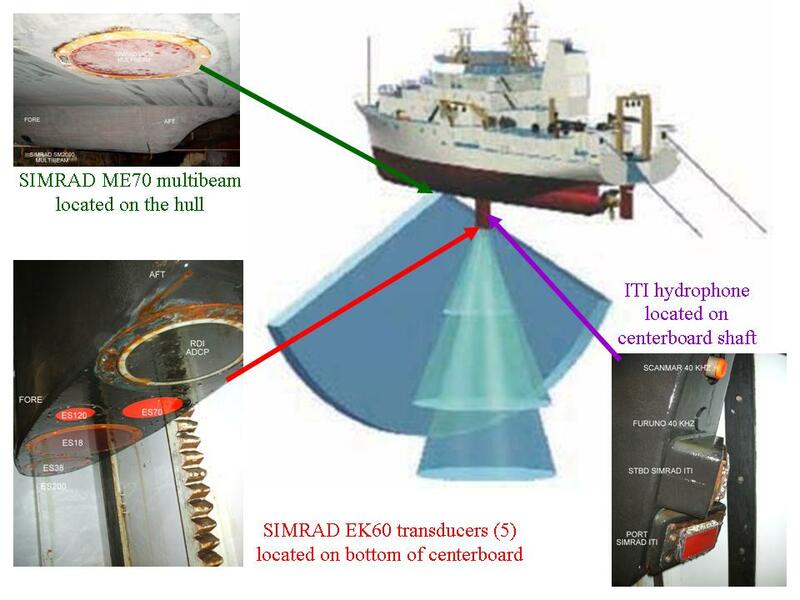 Basically, the trawl data verify and validate the acoustics data. 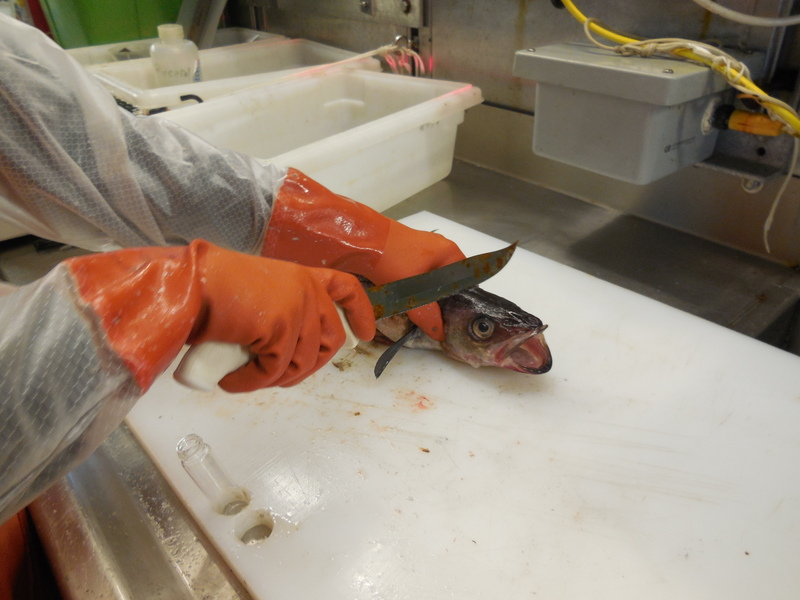 The acoustics data, collected in the Gulf of Alaska in systematic paths called transects, combined with the validating biological data from the numerous individual trawls, give scientists a very good estimate for the entire Walleye pollock population in this location. 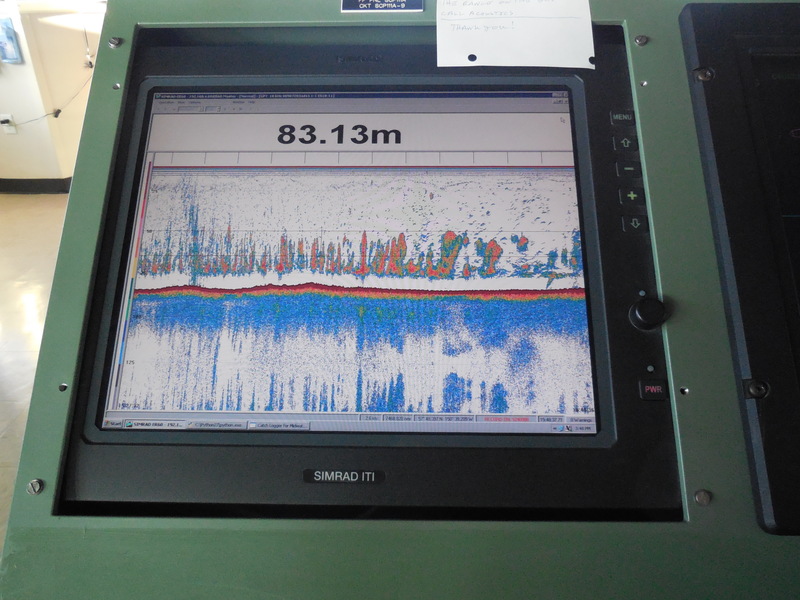 This screen is showing the echogram from the EK 60 echosounder during a trawl at 83.13 meters. The red line in the middle of the screen is the ocean floor. The colorful spikes above the red line indicate “backscatter” that is characteristic of capelin, a small fish that pollock feed on. Hydroacoustics (from Greek words: hydro meaning “water” and acoustics meaning “sound”) is the study of sound in water. Sound is a form of energy that travels in pressure waves. In water, sound can travel great distances without losing strength and can travel fast, roughly 4.3 times faster in water than in air (depending on temperature and salinity of the water). The Oscar Dyson has powerful, extremely sensitive, carefully calibrated, scientific acoustic instruments or “fish finders” including the five SIMRAD EK60 transducers located on the bottom of the centerboard, the SIMRAD ME70 multibeam transducer located on the hull, and a pair of SIMRAD ITI transducers on the trailing edge of the centerboard. This “fish-finder” technology works when transducers emit a sound wave at a particular frequency and detect the sound wave bouncing back (the echo) at the same frequency. When the sound waves return from a school of fish, the strength of the returning echo helps determine how many fish are at that particular site. Sound waves bounce or reflect off of fish and other creatures in the sea differently. Most fish reflect sound energy sent from the transducers because of their swim bladders, organs that fish use to stay buoyant in the water column. Since a swim bladder is filled with air, it reflects sound very well. When the sound energy goes from one medium to another, there is a stronger reflection of that sound energy. 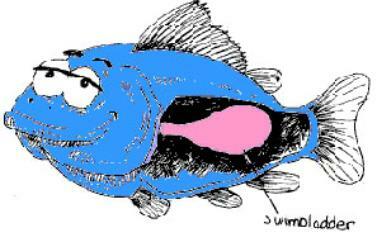 In most cases, the bigger the fish, the bigger the swim bladder; the bigger the swim bladder, the more sound is reflected and received by the transducer. The characteristic reflection of sound is called target strength and can be used to detect the size of the fish. This is why fish that have air-filled swim bladders show up nicely on hydroacoustic data, while fish that lack swim bladders (like sharks) or that have oil or wax filled swim bladders (like Orange Roughy), have weak signals. These reflections of sound (echoes) are sent to computers which display the information in echograms. The reflections showing up on the computer screen are called backscatter. The backscatter is how we determine how dense the fish are in a particular school. Scientists take the backscatter that we measure from the transducers and divide that by the target strength for an individual and that gives the number of individuals that must be there to produce that amount of backscatter. For example, a hundred fish produce 100x more echoes than a single fish. This information can be used to estimate the pollock population in the Gulf of Alaska. The above picture shows a computer screen with dense red “backscatter” characteristic of large amount of fish, most likely pollock. 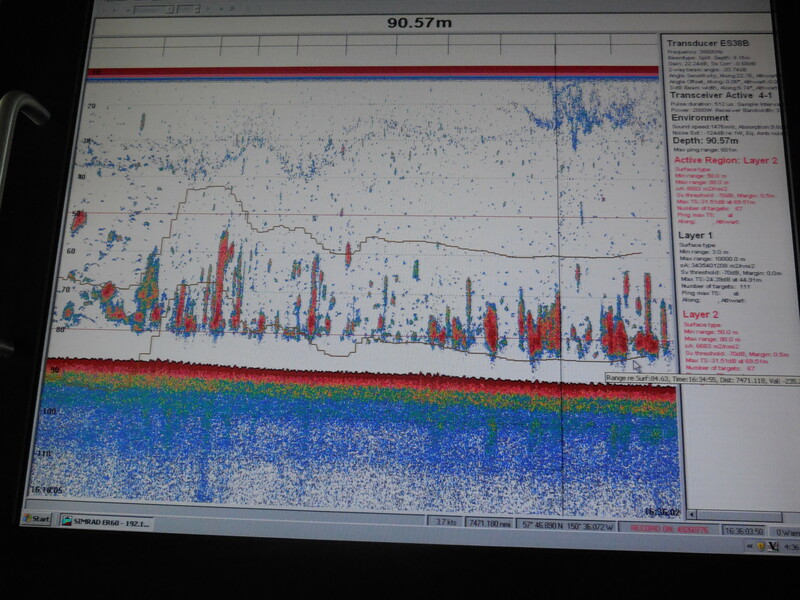 The yellow lines above and below the backscatter show the location of the trawl lines. 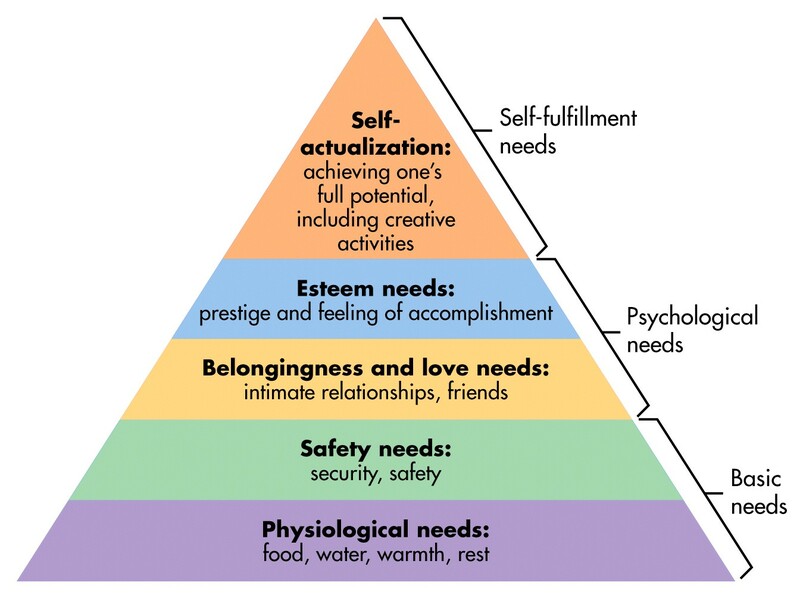 Continuing with Maslow’s hierarchy of needs, I will continue up the pyramid (see below) and discuss some ways that the basic need of safety is met on the ship. 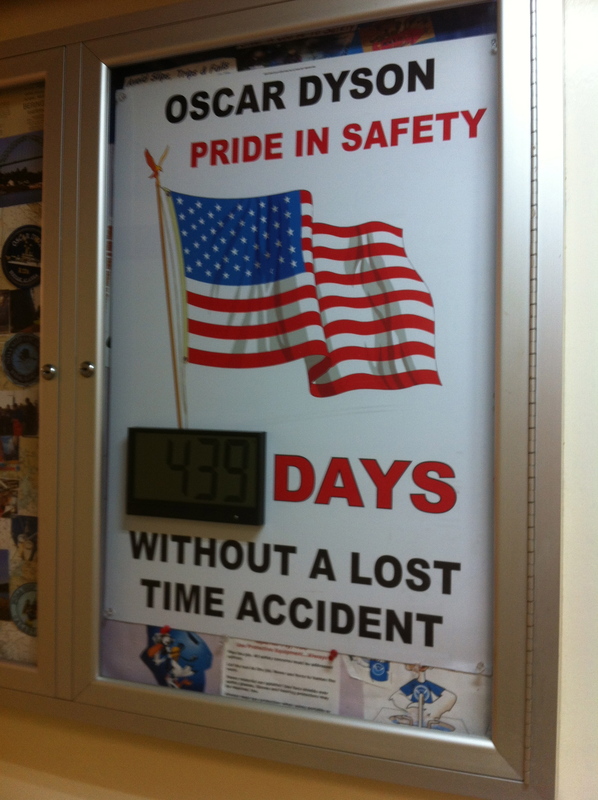 The safety and security of all staff (as well as sea animals we encounter) are top priority on the Oscar Dyson. There are constant reminders of this priority during ship life. 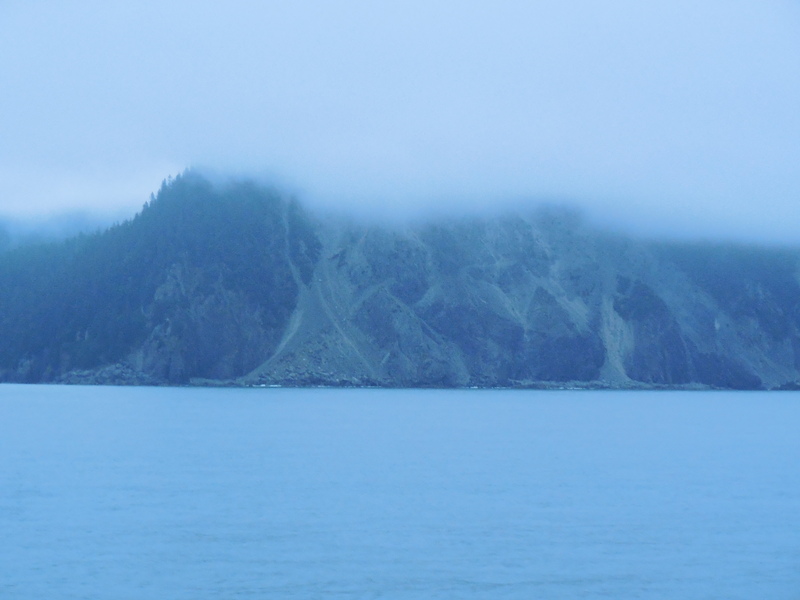 On the first day of our travel, before the Oscar Dyson was far from port at Kodiak, we had three drills. The fire drill and man overboard drill required me to report to the conference room and meet up with the rest of the science team. Patrick, the lead scientist, then reported that we (the scientist team) were all accounted for. The crew had more complex tasks of deploying a small boat and retrieving “the man overboard”. The other drill was the abandon ship drill. On the ship, every person is assigned to a life boat (mine is Lifeboat 1). When the drill commenced, I reported to my muster, the portside of the trawl deck, with survival gear: jacket, hat, survival suit and life preserver. We will have drills weekly at anytime. When working in the lab, the scientists wear orange slickers, boots, and gloves, not only to keep clean, but to protect us from anything that might be dangerous (fish spines, jellyfish tentacles, and so on). 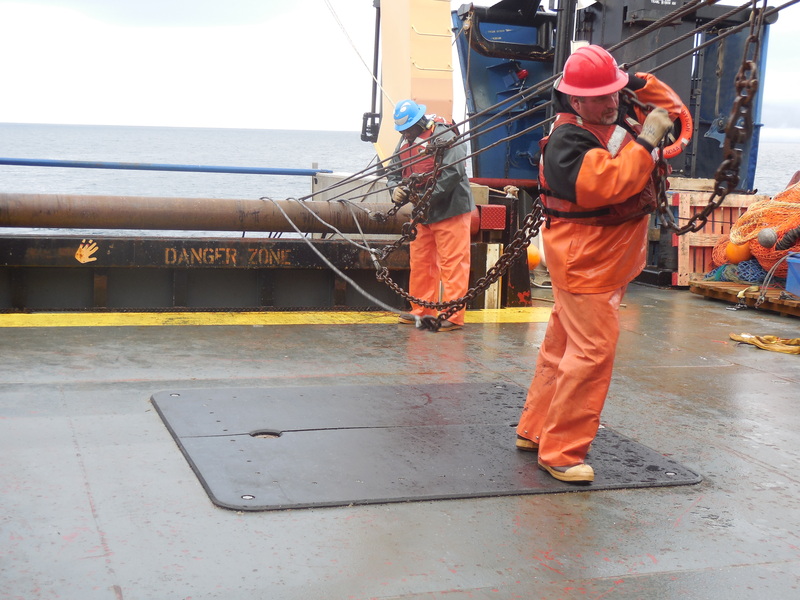 When on deck, we must wear hardhats (to protect from falling objects from the crane or trawl) and life preservers like the rest of the crew. Gloves, a Must in Fish Lab! 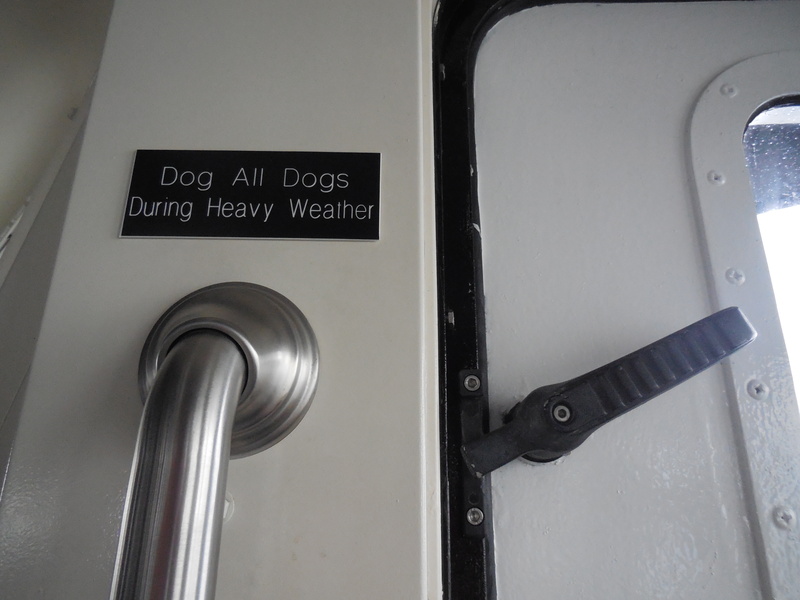 Watertight doors are special types of doors found on the ship which prevent the flow of water from one compartment to other during flooding or accidents. These doors are used onboard in areas, such as the engine room compartment, science and acoustics labs, and control bridge, where chances of flooding are high. 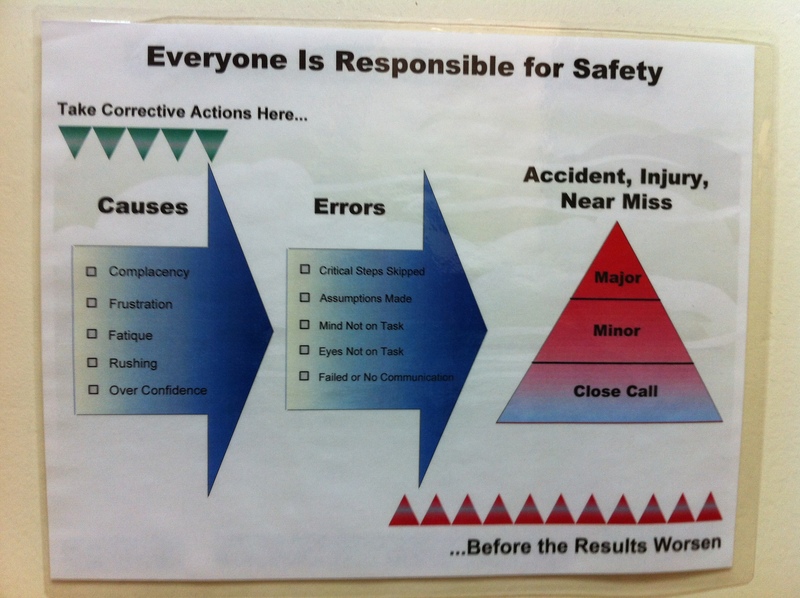 These are just a few examples of how safety is emphasized on the ship. There are reminders in one’s line of vision constantly. 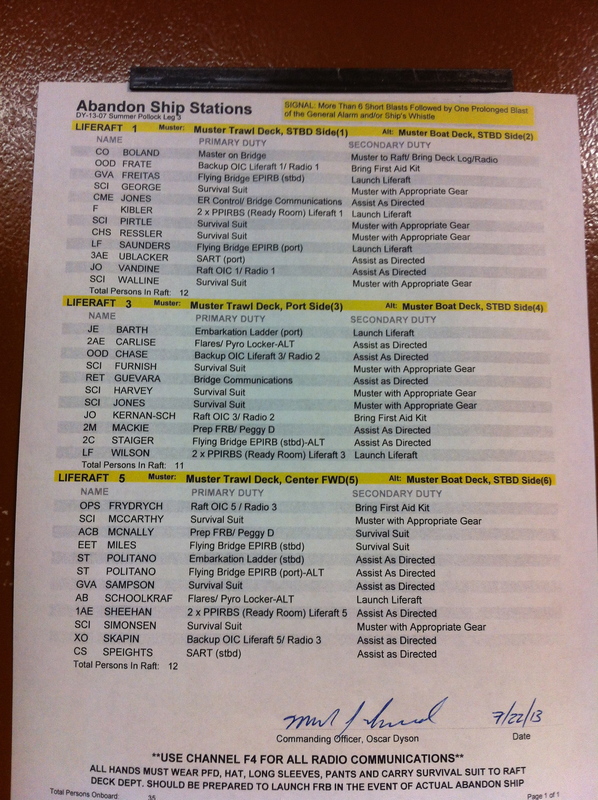 There are various seafarer or crew positions on the Oscar Dyson. A ship’s crew can generally be divided into three main categories: the deck department, the engineering department, and the steward department. 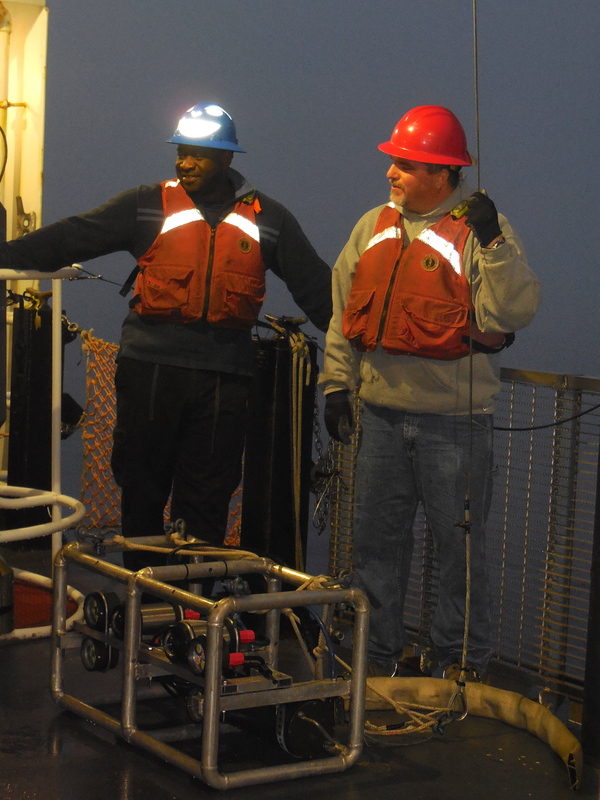 Rob and Greg are members of the deck department; both men hold Merchant Mariner Credentials as “Able Bodied Seamen” or ABS. Rob is from Boston, Massachusetts and went to school for seamanship in Fairhaven, MA. He considers his NOAA position as a good job with a good income, but his main profession is lobstering which he does on the open sea when he is not working for NOAA. Rob says, “The ocean is in my blood” and always wanted to work on it. Greg, on the other hand, chose to be a Merchant Mariner after a voyage at sea. He moved to Texas from Louisiana in his 20’s, went fishing for the first time, and got seasick. He considered battling seasickness a challenge, and thus pursing seamanship as a career. In his free time he is a free-lance photographer and journalist. Below are some pictures of Greg and Rob on the job. Notice they are always wearing their safety gear. Since I will begin teaching Zoology later in August, I have decided to highlight some of the animals that the scientist team has found in our trawls. 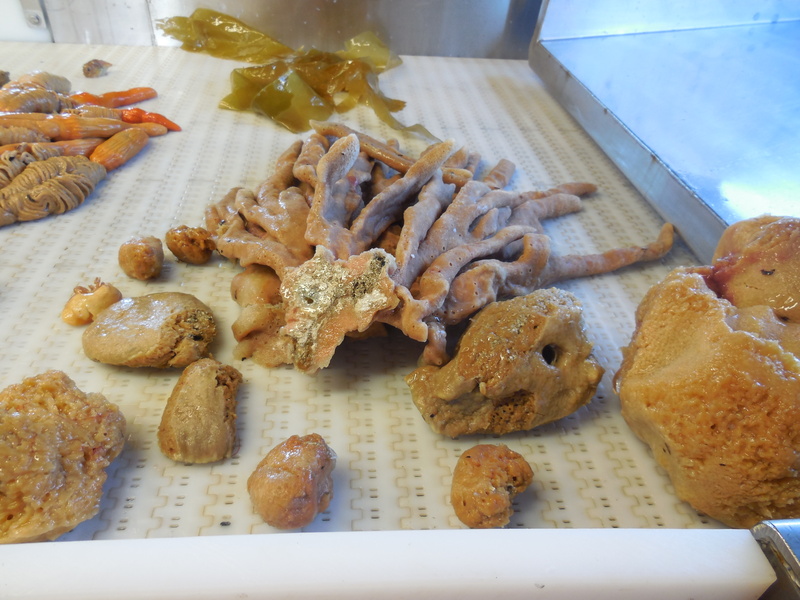 Today’s feature will be one of the simplest multicellular animal families, the Porifera. Porifera is a word formed from combining the Latin words porus which means “passage-way” and fera meaning “bearing.” Porifera, commonly referred to as sponges, have tiny pores in their outer walls that filter water to get nutrients. To learn more about the Porifera Family, click the Porifera on the picture below, and stay tuned for further exploration of this animal Tree of Life. Tree of Life: Can you spot the Poriferan?